After less than a week in space, Japan’s HTV-2 spacecraft was successfully grappled by the ISS crew via the SSRMS (Space Station Remote Manipulator System), ahead of berthing to Node-2 Nadir – which was completed at 0951 EST. Over the coming days, the ISS crew will remove external payloads from HTV-2 before moving the spacecraft to a temporary berthing location on Node-2 Zenith ahead of the arrival of STS-133 in late-February. Following launch and several days on orbit, HTV-2 was grappled by the ISS crew at 0641 EST. In preparation for the arrival of HTV-2, a potential problem that flight controllers and ISS crewmembers were trained for during the approach of HTV was a communications dropout through the Command Connection. 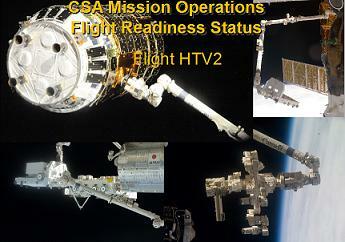 As reported in the Mission Operations Directorate Flight Readiness Review (FRR – over 50 presentations for HTV-2 available on L2), “Problem: AR 079240, MCCS – Command Connection for Clients Dropped, Major, 4/20/09. This could potentially mean a loss of HTV PROX Ops Commanding from SSIPC, but not a loss of HTV telemetry to SSIPC. The probability of such and occurrence is low as there were only 5 occurrences of this issue in 2009 and 8 in 2010 – none of which occurred during a spacecraft rendezvous with ISS. The occurrences are random and not predictable, and the last occurrence of this issue was on November 4, 2010. Nonetheless, should the issue present itself during HTV-2 rendezvous, the ISS crew could abort or hold HTV-2’s approach to the station until the Command Connection can be reestablished. In addition to this issue, JAXA has also flagged an MCC-H (Mission Control Center Houston) Dropbox issue. “The MCC-H dropbox will not receive/deliver files sent from International Partners at the time they are sent because those files have a future timestamp with the large time zone differences,” notes the Mission Operations Directorate FRR, available for download on L2. “A polling software limitation issue occurs at the beginning of each month between MCC-H and SSIPC using local time stamps with large time zone differences. To date, JAXA is the only International Partner to flag this as an issue, mainly due to the potential 15-hour lag time between the receipt of the file on the MCC-H server and the processing of that file. 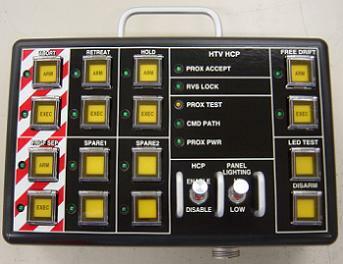 In the end, the arrival of HTV-2 was without issue. Following the STS-133/ULF5 flight of Discovery to the ISS – currently targeted for launch on 24 February 2011 – the ISS crew will use the now two-year-old SPDM (Special Purpose Dexterous Manipulator) robot, affectionately known as Dextre, to transfer the FHRC and CTC external payloads from the HTV-2 to the newly delivered/installed ELC-4 pallet – a move representing a new robotic operations procedure for the ISS crew. However, as with all things in the business of space travel, there is a possibility the SPDM could experience a failure that would prevent its use in transferring the FHRC and CTC from HTV-2 to ELC-4. Should this happen, two ISS crewmembers would have to undertake an unplanned contingency EVA (spacewalk) to manually move the two components to ELC-4. Should this EVA become necessary, a minimum of two weeks lead time would be necessary to adequately prepare and uplink/review the necessary EVA materials to the ISS crew. While the likelihood of SPDM failing and the contingency EVA being necessary is slim, the fact remains that this flight of HTV-2 will be one of numerous firsts and previously unplanned events. A portion of HTV-2’s mission will bridge the ISS indirect crew handover in March, the HTV will be directly mated to Node-2 Zenith before and during Shuttle Discovery’s visit in February/March, and the ISS crew will be tasked with transferring two new racks from HTV-2 to the JEM-PM (Japanese Experiment Module Pressurized Module): the KOBAIRO and MSPR. 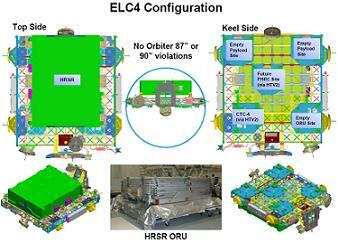 Furthermore, should Discovery’s STS-133 mission be delayed further, beyond its currently planned NET (No Earlier Than) 24 February launch date, the ELC-4 would not be available for the FHRC and CTC external payloads from HTV-2, and HTV-2 itself would not be available for disposal of several PMM (Permanent Multipurpose Module) RSP supply transfer racks. 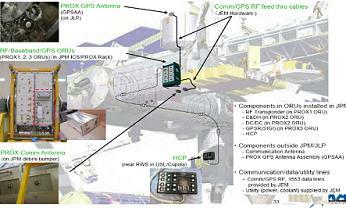 Additional new HTV-2 internal payloads include the International Space Station Agricultural Camera (ISSAC), Re-Entry Breakup Recorder (REBR), and Amine Swingbed (only a portion of the hardware on HTV-2). The remaining items in HTV-2 are resupply items for existing payloads. All these payloads are unpowered and carry no transfer constraints. Additionally, the PMM on Discovery is also launching the permanent power jumpers that will be required for HTV-2’s berthing on Node-2 Zenith. Since Discovery will be launching after the HTV-2 is berthed to Node-2 Zenith, this initially left NASA/JAXA with four options: retrieve the already packed power jumpers from the PMM and launch them on HTV-2, build a new set of jumpers and launch on HTV-2, build a Pin Kit version of jumpers and launch on HTV-2, or build Pin Kit jumpers on orbit. Option one, to retrieve the jumpers from the PMM, was not possible due to a Space Shuttle Program directive to leave the PMM installed in Discovery’s payload bay for the vehicle’s rollback and stay in the VAB for ET intertank stringer inspections and repairs. (Refer to live coverage threads linked above. L2 members refer to HTV sections for a vast array of presentations and handbooks, etc. Images used, NASA.gov and via L2 acquired PRCB presentations).